In Memphis’s Forrest Park, there’s a statue of Nathan Bedford Forrest, one of the most infamous and powerful racists in American history. Lately it’s been at the center of the city’s often shaky race relations. One Memphian and self-proclaimed member of the Grape Street Crips seemed to take the Klan’s threats to return to his city very seriously. Following the announcement of the planned rally, 20-year-old DaJuan Horton posted a video on YouTube in which he states that he’s organizing a consortium of local gangs to unify and show their discontent on the day of the rally. Local and national media suddenly became very interested in the impending event, whipping a diverse cross-section of the city into a frenzy. 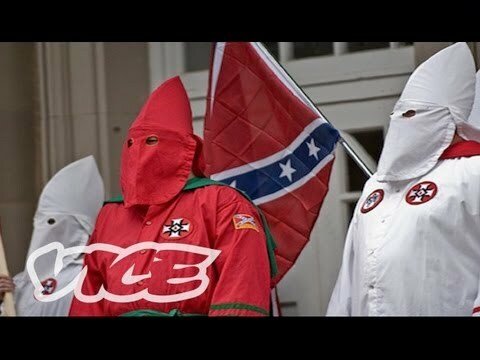 In the first video of the series we meet the KKK members who plan to rally in support of Nathan Bedford Forrest and the local gang members who have a different idea in mind. In part 2, we learn how the history of the Ku Klux Klan and General Forrest relate to Memphis today. In part 3, the local Memphis gangs form a mega alliance called Devine United International or D.U.I. for short. In the final video, DaJuan and the rest of the gang mega alliance decide to stay in as the Klan continues to rally through the cold and rainy day.